I have been looking forward to the weekend because i planned to do some shopping on Saturday. All the stress at work got me in dire need for a fashion refill. Well not exactly a "refill" but more of emptying my pockets...hah....but doesn’t matter. I'm ready to part from a couple of hundreds in return for a sense of satisfaction. Always loved the feeling of buying something lovely and felt proud of it. Thats the way I intend to "recharge" myself this weekend. I woke up around 10 on Saturday, by the time I got myself ready and left the house was around 11 something. I planned to go to "ji cheong kai" or also known as Petaling Street to splurge myself with a ticket of indulgence or two. PS is a famous for lots of "imitation goods". Although personally I never bought any imitation items despite being tempted manymanymany times. I try my best not to support piracy but sometimes "the spirit is willing but the flesh is weak". Why i chose PS as my destination today. Well, firstly I haven’t been there for quite some time, besides, where else is best for me to spend a couple of hundreds as though I’ve spent thousands??!! U see, in PS, you can spend like a mere RM200 and bring back like 5 tops, 2 skirts, 2 dresses and maybe a pair of sandals or two even. Where as if i choose to go to KLCC. RM200 can get me maybe 1 or at most 2 tops. Thus I chose to go to PS cos I want to come back feeling like some freaking RICH women. heh.. I'm not gonna drive there cos noone ever drives there.....there's hardly any place to park albeit the jam. I drove myself to Kelana Jaya LRT station, grab myself a book and off I went. I think its approximately a 15-20 minute ride from KJ to PS. One thing I noticed in Malaysia is that I seldom see anyone reading in the train. I find that rather strange cos everywhere I go be it Singapore’s MRT or the trains i took in Europe I always see ppl reading. Here, ppl just STARE at others while waiting for their stop. Either that or they'll be chatting on the cell phone. Anywayz, a short journey and im there! ah....shopping heaven!!! I walk a short distance frm the LRT and i found myself walking through the crowd of Petaling Street. Oh did i mention that this is a fine place to get fresh fruits too. Lovely,juicy fruits. Mongos, lychees(seasonal), grapes, oranges,apples and all sorts. You can also find the best "bak kwa" and hot and yummy "roasted chestnuts" fresh frm the furnace. Coming back to shopping, it didnt take long for me to start flexing my muscles. teehee.......in 15 minutes i grabed myself a cotton short sleeve button top in pink and white. Only RM 13 (approx USD 3.50). 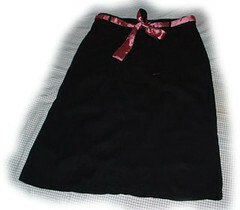 And a black a-line skirt with pink and black ribbon belt shown below at RM 39.90(USD10), i got 20% off. Already satisfied, I walked out of the shops into the streets to take a look at what the stalls have to offer. Boy I tell you those imitation Diors, Guccis, Pradas, Burberrys and LVs are so so pretty, and it looks very real too. Saw a dior and i just had to ask the price......And this ahpek says RM85 only. OMG.... I exclaimed out loud. "KAM KWAI!!!????" (= so expensive), he then chose to completely ignore me. Probably he thought I couldnt afford it since I wore my old ragged - Lion King T-shirt with a semi skirt-shorts and ahbeng glasses. hmmphhh......who needs em cheapskates......sheeshh......Anyway, at most I think it costs about RM50 for those bags. Tips: Always cut the price by half of what they have to offer. Negotiation skills are a must if you wanna shop in PS. Feeling rather agitated with the ahpek, I left PS and went opposite the street to Kota Raya. Nothing to see but I still found a pair of lovely slip-on sandals. I really love them. RM29.90 (less than 10usd). The Manolo will be so proud. 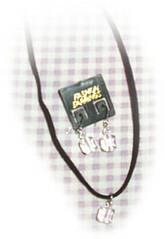 Before leaving the place I grabbed a necklace with matching earrings with square crystals. Love the square swarovski. RM32.80. Total items = 1 Top, 1 skirt, 2 dinner dresses, 1 sandals, 1 necklace and a pair of earrings. Minimum cash out, maximum satisfaction in. All in all its a good day. ps. If you want to shop at Petaling Street. You must make sure you really really have an eye for fashion so as to not end up buying trashy items that could very well put you into the fashion hall of shame. heh.....must really really be careful of what you buy cos they have everything. I love going to Petaling St! That's also where my friends and I found the best and juiciest roast duck (or was it goose?). Yum!